wall ovens in nearly 13 years. This has been in the works for some time now and the entire cooking line will have a facelift over the next 2 years. The all important wall ovens are the first new products to be introduced. There have been only a few changes, but they are key changes. Updated control panel: Standard gray plastic touch controls become Stainless Steel touch controls. These models have many changes in appearance and performance, with the addition of a new size. Dual VertiCross convection system has 2 corner column fans and heating elements for better heat saturation and distribution, meaning a more even cooking on all racks. 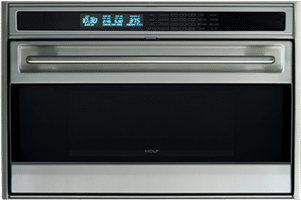 Professional: Stainless steel with professional handles, LCD Touch control panel, and classic knob design for temperature control and mode selections. There will also be a new size, 27”, which was brought into the lineup for direct replacement business to compete with other professional brands that offer this size. This will only be available in the M series transitional design lineup. It will have a 4.5 cubic foot capacity and will be available in both a single and double oven. 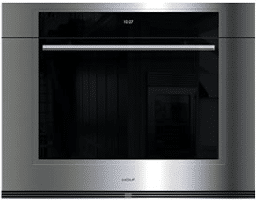 The 36” L series single oven has also been redesigned in the new M series transitional lineup. This model now features a staggering 6.3 cubic foot capacity, up from 4.4 cubic foot capacity. With the interior features improved with the new Dual VertiCross convection system, this capacity increase was able to be done without any increase to the physical size of the oven. These changes have been designed to improve cooking performance, a more uniform appearance throughout the entire cooking product line, and to provide a more user-friendly interface, making it easier to operate the ovens. Pricing has yet to be announced on these new models at the time of writing. The Wolf product line is considered THE brand in residential cooking appliances. Download the Yale Wall Oven Buying Guide with specs, features and inside tips to every major brand of wall oven in the market. Over 35,000 people have read a Yale Guide.